The Incunabular Sideboard is part of the iconic first collection design by Architect Simon Moorhouse for Invisible City. The Incunabular Collection uses a modular design concept based on the dimensions and ratios of the international paper standard ISO 216, Series A. This geometric rationale uses the square root of 2, which maintains the aspect ratio of each subsequent module, i.e. A5, A4, A3 etc. In 2015 our unique Incunabular leg design was reengineered using a composite design and revolutionary 3 Cut manufacturing process. The new leg imbues the Incunabular Collection with a ‘lightness’ which belies its beautiful solid wood construction. Dimensions: 1680mm W x 400mm D x 750mm H Materials / Finish: American Black Walnut or European Oak / oiled with Signal White / Gray or ‘Stone’ colour way lacquered doors. In 2015 our unique Incunabular leg design was reengineered using a composite design and revolutionary 3 Cut manufacturing process. The new leg imbues the Incunabular Collection with a ‘lightness’ which belies its beautiful solid wood construction. 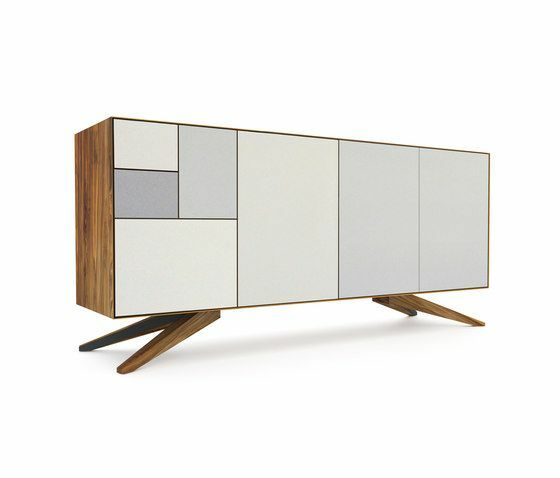 The Incunabular Sideboard has solid wood carcass with matching solid wood or lacquered handless doors and drawers. We use environmentally friendly, solvent-free water-based hydro-UV lacquer for painted elements of our furniture. Invisible City’s timber is Forest Stewardship Council® (FSC®) approved or from locally managed woodlands. Our premium grade timber is carefully hand selected for its character and richness of colour. Invisible City’s furniture is finished with Osmo Polyx Oil®, a hard wax oil, which keeps the timber looking and feeling natural. The Incunabular Collection only uses Blum® or equivalent high quality fittings. All metal components are laser cut and precision TIG welded as part of our commitment to creating the highest quality furniture. Invisible City’s bespoke services work closely with private and commercial clients all over the world to create beautiful tailored pieces or collections. From the incorporation of contract friendly materials and audio visual equipment to the creation of an exceptional single gallery piece, we are able to accommodate your needs.